Seven MPs have resigned from the Labour Party in protest at Jeremy Corbyn's approach to Brexit and anti-Semitism. Ms Berger said Labour had become institutionally anti-Semitic and she was "embarrassed and ashamed" to stay. 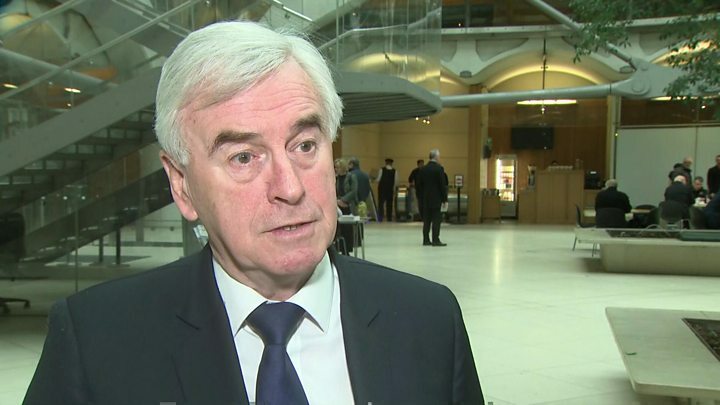 Shadow Chancellor John McDonnell said the "honourable thing for them to do" would be to stand down as MPs and seek to return to Parliament in by-elections. Kuenssberg: What next for Labour's breakaway MPs? Who are the Labour MPs resigning? Labour's deputy leader Tom Watson, in a video message on Facebook, urged the "hard left" to stop celebrating the departure of the seven MPs, saying it was "a moment for regret and reflection not for a mood of anger or a tone of triumph". "Betrayal narratives and shouting insults at the departed might make some feel better briefly but it does nothing to address the reasons that good colleagues might want to leave," said Mr Watson. He said Luciana Berger's decision to quit was a "wake-up call for the Labour Party" over anti-Semitism, saying: "We were slow to acknowledge we had a problem and even slower to deal with it." Labour had to "broaden out" and become more tolerant, he said, adding: "I love this party. But sometimes I no longer recognise it, that is why I do not regard those who have resigned today as traitors." What is the new group trying to do? The seven MPs, who all back a further EU referendum, are not launching a new political party - they will sit in Parliament as the Independent Group. But Chuka Umunna said they had "taken the first step" and urged other Labour MPs - and members of other parties - to join them in "building a new politics". "It is time we dumped this country's old-fashioned politics and created an alternative that does justice to who we are today and gives this country a politics fit for the here and now - the 21st Century," he said at a launch event in central London. He said there would be "no merger" with the Liberal Democrats, who have 11 MPs, and the group wanted to "build a new alternative". The group rejected comparisons with the Social Democratic Party - which broke away from the Labour Party in the early 1980s but eventually merged with the Liberal Party - saying it was a different era and they would not be contesting by-elections. Who were the Social Democratic Party? In a founding statement on its website, the group sets out its approach to the economy, public services and security, as well as Brexit. 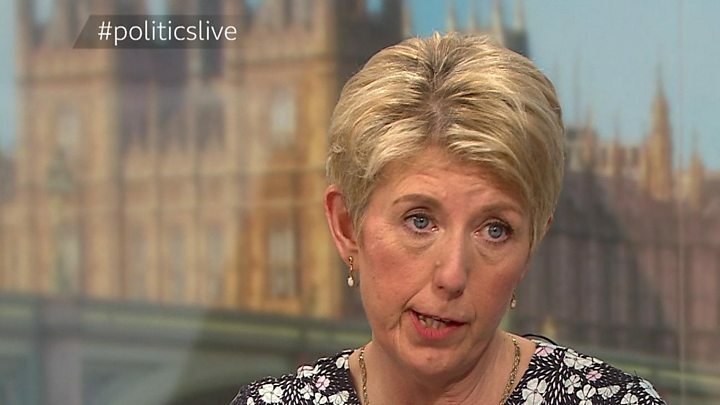 One of the seven MPs, Angela Smith, has, meanwhile, had to apologise after being criticised for a comment about skin colour on BBC Two's Politics Live programme. In a discussion about race, the MP appeared to say: "It's not just about being black or a funny tinge." She has since posted a video on Twitter apologising for the comment, adding: "I am very upset that I misspoke so badly." Could more MPs defect to new group? 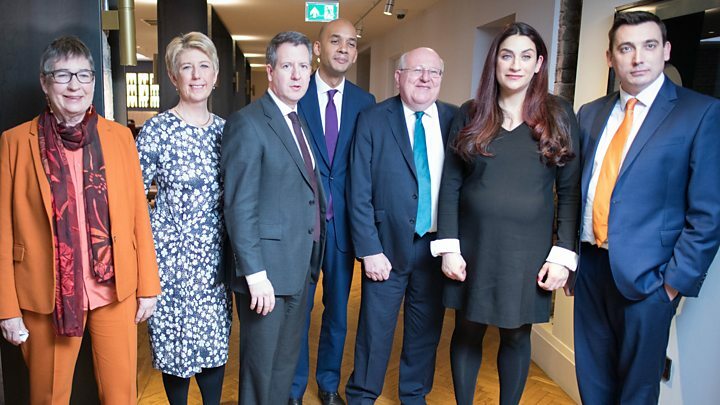 Defections to the Independent Group are likely to increase - but it will need to attract some of those beyond Labour to become a proper "centre party". Two more MPs were undecided about whether to be at the launch, one of them was 90% but clearly not 100% there. And more still may be persuaded to go unless they see a more robust response to anti-Semitism. But strong supporters of the Blair/Brown governments such as Peter Kyle and Ben Bradshaw are staying to fight their corner on Brexit and it's likely in the short term the numbers who do go will be small. This is no simple centrists v left, or indeed, ultra left split. However, the reaction of left-wing activists to today's drama could be crucial. If they feel fired up to de-select those who share the politics of the defectors but who have no intention of leaving Labour, the splinter could yet become a more sizeable split. What did the defecting MPs say? Ms Berger said: "I am leaving behind a culture of bullying, bigotry and intimidation." Chris Leslie said Labour under Mr Corbyn had been "hijacked by the machine politics of the hard left". Mike Gapes said he was "sickened that Labour is now perceived by many as a racist, anti-Semitic party" and "furious that the Labour leadership is complicit in facilitating Brexit". How did it go down with other Labour MPs? Senior Labour figures, including former leader Ed Miliband and London Mayor Sadiq Khan, expressed their dismay at the split, with Mr Khan saying on Facebook that the seven MPs were friends of his but he would not be joining their new group and it was a "desperately sad day". In a statement, Jeremy Corbyn said: "I am disappointed that these MPs have felt unable to continue to work together for the Labour policies that inspired millions at the last election and saw us increase our vote by the largest share since 1945." What about the unions and Momentum? GMB leader Tim Roache described the MPs' actions as "unforgiveable", adding that they were "hardly the Magnificent Seven". Unite general secretary Len McCluskey, a close ally of Mr Corbyn, said there was a "strong whiff of hypocrisy" about the resigning MPs because they had stood on a manifesto at the 2017 general election that "promised to respect the 2016 referendum taking us out of Europe". Jon Lansman, the founder of the pro-Corbyn Momentum campaign group, said he had "personal sympathy" for Ms Berger because of the "hate and abuse" she had suffered. But he said the other six MPs were malcontents opposed to Mr Corbyn's leadership, telling BBC Radio 4's World at One: "These are people who are not heavyweights and do not have clear policies." How have other parties reacted? Liberal Democrat leader Sir Vince Cable said the split was "not unexpected, or unwelcome" and his party was open to "working with like-minded groups and individuals in order to give the people the final say on Brexit, with the option to remain in the EU". Conservative Party Chairman Brandon Lewis said the resignations had confirmed that Labour "has become the Jeremy Corbyn Party - failing to take action on everything from tackling anti-Jewish racism to keeping our country safe". Former UKIP leader Nigel Farage, whose new Brexit Party launched earlier this year, tweeted: "This moment may not look very exciting but it is the beginning of something bigger in British politics - realignment." How many MPs are independent? The resignation of seven Labour MPs leaves Jeremy Corbyn with 248 MPs under his leadership. For now, the new group will sit as independents, but could soon form a new political party. Five other MPs are already sitting as independents after leaving the Labour Party for various reasons, but they are not part of an organised group. Separately, Peterborough MP Fiona Onasanya was kicked out of the party when she was jailed in January. There are two other independent MPs - former Lib Dem Stephen Lloyd, who quit his party because he disagrees with them on Brexit, and North Down MP Lady Sylvia Hermon - a former Ulster Unionist. Don't the new Independent Group have to form a party? Parties are membership organisations that are registered with the Electoral Commission and stand candidates in elections. They also have a leader. One major advantage of forming a party - rather than just a Parliamentary group - is that you qualify for government money to help with research, which may be a factor in the new group taking the next step. Under the rules of Parliament, none of the MPs who have resigned from Labour today have to put themselves forward for re-election in their constituencies.